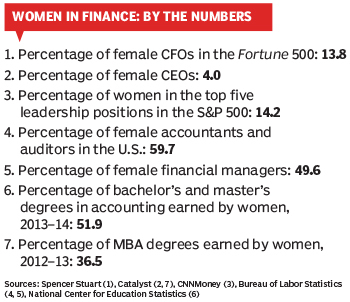 More and more women are rising to the CFO spot at America’s largest companies. Of the 308.7 million people counted in the United States 2010 Census, some 50.8% were women. Seen against that number, the 13.8% of Fortune 500 companies that currently have women occupying the top finance job may not be encouraging to those who value gender diversity, at least when it comes to C-level jobs in Corporate America. But there has been a steady, if slow, increase of diversity over the past decade or so. The percentage of female Fortune 500 CFOs at the end of 2015 is more than double the 6.8% reported as of year-end 2006, and that score has risen in almost all of the years in between. Similarly, the 29 people of color (6%) who are finance chiefs at America’s largest companies is up from 16 (3.3%) in 2006, according to figures compiled by executive search firm Spencer Stuart. The advance of women in finance has been pretty much spread out among all sectors of the economy, with all industries except for life sciences having seen an increase in female CFOs in 2015, Spencer Stuart reports. Revealingly, the technology, media, and telecommunications sectors — all industries in a high state of flux and the most likely to recruit CFOs from other sectors — currently have the highest percentage of female finance chiefs. Silicon Valley itself, although not known particularly as an employment mecca for gender diversity, has seen a relatively high proportion of women become finance chiefs at large public companies, with prominent examples including Microsoft’s Amy Hood, Alphabet’s Ruth Porat, Kelly Kramer of Cisco Systems, and Judy Bruner of SanDisk. But it may prove to be some time before the number of female CFOs in general reach anything approaching women’s majority status in the population. In other cases, behavioral biases can cause women and their ideas to be overlooked. At the same time, says Butler, the relative lack of assertive behavior on the part of women can prove an advantage when it comes to the leadership skills they need to succeed. “It models the behavior that helps teams collaborate,” she argues of the need to play the proverbial game. A major factor that continues to hold women back is motherhood and the need to balance work and family. But there are signs that this age-old obstacle may be on the way to becoming, if not a non-issue, at least a concern shared by both partners in a marriage. “Do you ask men the same question?” was the way Elizabeth Reese, CFO of AGL Resources, an Atlanta-based energy company, responded when asked how she balances work and family. For some women, like AutoNation CFO Miller, who married last year and has no children, the work-family balance conundrum has yet to come into play. “For me it’s been a matter of work hard, play hard,” is the way she puts it. Estée Lauder CFO Tracey Travis has two daughters (one a college graduate and the other just starting college) and admits there often were times when she had to draw the line when her children were growing up. “The weekends were off-limits” to work, recalls Travis, who held CFO positions at four other companies before joining Estée Lauder in 2012. Family concerns, notes Spencer Stuart’s Quint, are not exclusively the concerns of women these days. “It’s more of a question of individuals,” she says. In any case, companies and those that recruit for them are increasingly seeing gender diversity not only as a worthy goal in and of itself, but also as a way to improve company performance. 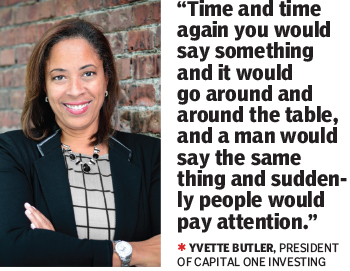 “If you come at it with a more diverse perspective, you create a more successful company,” contends Capital One Investing’s Butler. But, he admits, this progress will take time. “It takes a long time to build up that bunch of candidates who are qualified,” he says. 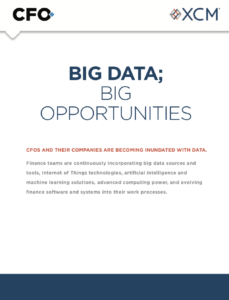 For a personal perspective on the growing role of women in finance, CFO spoke to 4 of the 67 women who have made it to the top finance position at Fortune 500 companies, getting their take on their career paths and the challenges (gender specific or otherwise) they have faced along the way. Their stories follow. 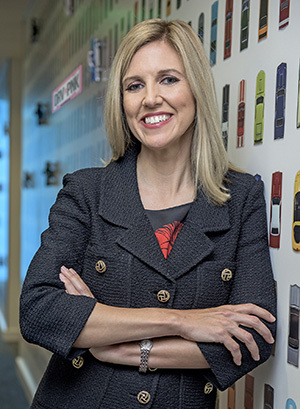 Cheryl Miller is executive vice president and CFO of AutoNation, which is the largest retailer of automobiles in the United States. 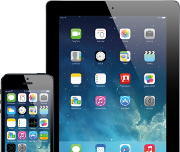 The company has 26,000 employees and booked nearly $21 billion of revenues in 2015. Miller began her career in the financial management training program at Circuit City’s corporate headquarters and has since racked up more than 20 years of corporate finance experience, including over 15 years in the auto industry, including retail, rental, distribution and captive finance. She joined AutoNation in 2009 as treasurer and vice president of investor relations. Since becoming CFO in 2014, Miller is credited with helping AutoNation achieve key milestones, including attaining its lowest-ever sales, general, and administrative costs as a percentage of gross profits and becoming the only automotive retailer in the U.S. to earn an investment-grade rating. But although Miller is relatively young (43) for her level of accomplishment, she nonetheless can look back to an era when there were hardly any women in finance, particularly insofar as the auto industry was concerned. Still, Miller is not alone as a woman in the executive suite, sharing that distinction with Donna Parlapiano, the company’s senior vice president in charge of franchise operations and corporate real estate. She also credits a support network of both men and women for helping her along the way. AutoNation chairman and CEO Mike Jackson has been supportive of her, she says, noting that his wife, Alice Jackson, provided a close-up example of a successful businesswoman as a commercial real estate broker. If any woman could be said to have a female-friendly company to work for, it would have to be Tracey Travis, who became executive vice president and chief financial officer of cosmetics and personal care products giant The Estée Lauder Companies in 2012. Not only was the company founded by a woman, but the vast majority of the company’s customers are women, as well as 84.7% of its 44,000 employees, 3 of 12 of its executive officers, and 7 out of 15 of its board members. Given that Travis was CFO of Ralph Lauren from 2005 to 2012 and held finance positions at Intimate Brands and Limited Brands before that, one would be tempted to look at her career as one conducted (and nurtured) in companies that had a strong female cohort. But this was not the case when she started out. With the addition of her two daughters to the family, “we decided we needed a live-in, but in terms of who would actually be the parent, who would be available in terms of parent-teacher conferences, we decided it would be [her husband],“ she says. This supportive family setup was probably also a great help when Travis engineered her career shift from engineering to finance, going back to school and getting her MBA from Columbia University with a double concentration in finance and engineering operations. She eventually parlayed her background into work at Pepsi Bottling, including six years managing a bottling plant, before moving to the fashion and personal care sectors. Her work spanning decades and industries has given her a singular perspective on issues of diversity. “Early in my career, women who were very smart and very driven were not seen the same as men with these same characteristics,” she recalls. Kelly Kramer is executive vice president and CFO of Cisco Systems, where she manages the financial strategy and operations of a company with more than 72,000 employees and about $50 billion in revenue. Kramer, who joined Cisco in 2012 after spending 20 years working at General Electric across many divisions and countries, ascended to the top finance spot at the tech giant in early 2015. Today, Kramer has a C-suite leadership role in an industry not particularly noted for its diversity, at least insofar as its lower and middle ranks are concerned. “It’s pretty well documented that tech has been low on the gender-diversity scale,” she admits. At the same time, as she points out, despite their relative absence in line-level jobs like programming and coding, women have managed to make it to the upper echelons in many tech companies like Cisco, where 40% of the executive team is female. And this has proven to be particularly the case in finance, when you consider her and the other women cited above who have succeeded becoming CFOs at major tech companies. Elizabeth (Beth) Reese was named CFO of AGL Resources in 2015, directing finance, accounting, and business-planning functions for the Atlanta-based energy services holding company, which operates seven natural gas distributors in seven states, servicing some 4.5 million customers. Since at least 2012, when she became the first woman president of AGL’s Nicor Gas utility in Illinois, Reese has been a champion of diversity-related programs at the company. That year she became the first chair of its LEAD (Leadership, Empowerment, Acceptance, Diversity) Council. In this capacity, Reese has come to appreciate the importance of nurturing women at the earliest ages. “We need to get girls age eight and nine interested in math and the other STEM [science, technology, engineering, and math] subjects,” she says. Ed Zwirn is a freelance writer based in Bethel, New York. All photos courtesy the companies. Just wanted to add one more person to your list, Maureen O’Connell; she serves as Executive Vice President, Chief Administrative Officer and Chief Financial Officer at Scholastic Corporation, the global children’s publishing, education and media company.